Tour the nation's oldest city and learn its fascinating history while hopping on and off at various attractions, restaurants, and more with Ripley's Sightseeing Trains. 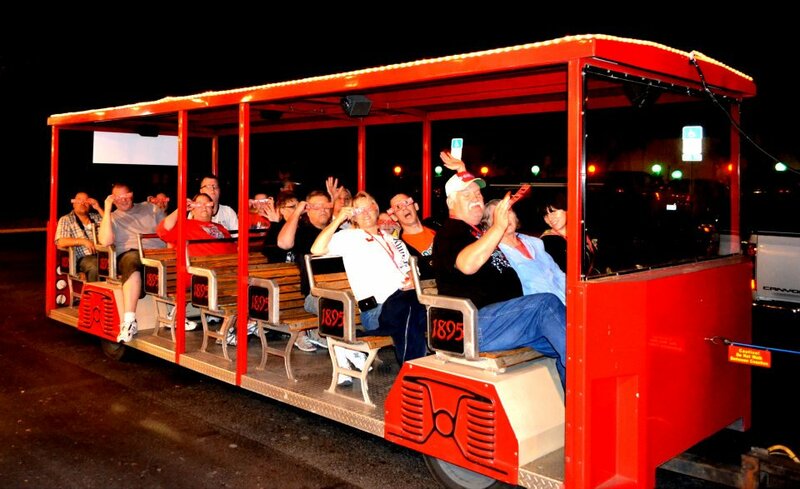 The Red Train Tours, operated by Ripley’s Believe It or Not! since 1953, take guests on a comprehensive tour through the nation's oldest city. 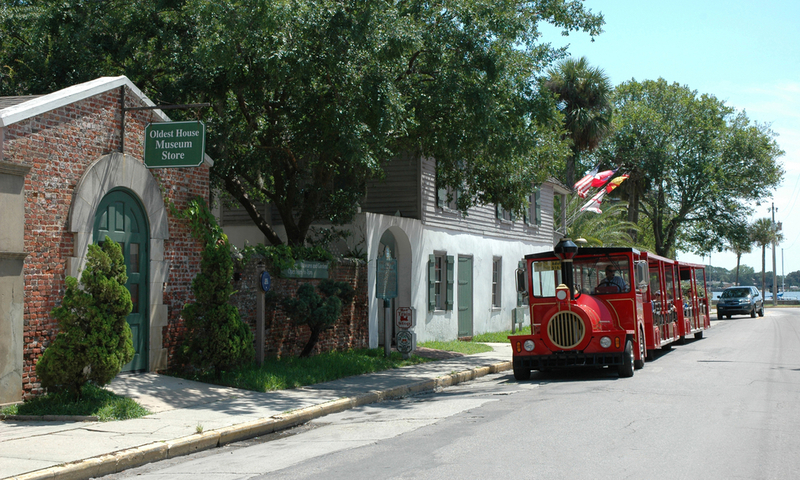 Vacationers can take advantage of the 22 stops along the Red Train’s route through historic downtown St. Augustine.These stops allow guests to access the historical sites, restaurants, and shopping opportunities in the historic district. Tickets are good for three consecutive days, and guests are able to re-board from any of the stops in the downtown area.The tours go out from 8:30 a.m. to 5 p.m. every day. Every 15-20 minutes, a train passes by one of the twenty-two stops, meaning transportation is constantly available. 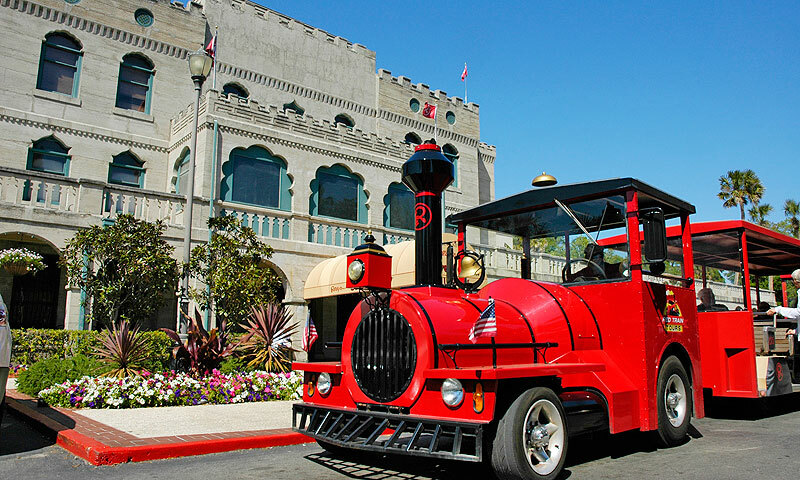 Guests can purchase discounted tickets to other attractions in St. Augustine from Ripley’s Red Train Tours. Guests on the Red Train Tours are able to download a free app (available from Google Play or iTunes) and use headphones to listen to the Red Trains' fully-narrated tours in Spanish or French. The app also includes a transcription of the tour's content so guests may read along. In addition, the app features an interactive map that shows all the tour stops, as well as GPS trigger points that keep up with riders at each of the tour's 22 stops, making it possible for guests to enjoy historical points about St. Augustine without missing a beat. Earbud headphones will be available at the Red Trains ticketing locations for use with the interactive app. The Red Trains operate from 8:30 am to 5:00 pm every day. Call (904) 829-6545 for more information. Thus would be our 4th time on the Ripley's red train. My family and I love doing this every time we come up. The drivers are full of knowledge and every driver has different stories to tell. Very interesting and never boring. This time we had Alex and Benji. Not only were they very knowledgeable but both had a wonderful sense of humor. Definitely people persons for sure. 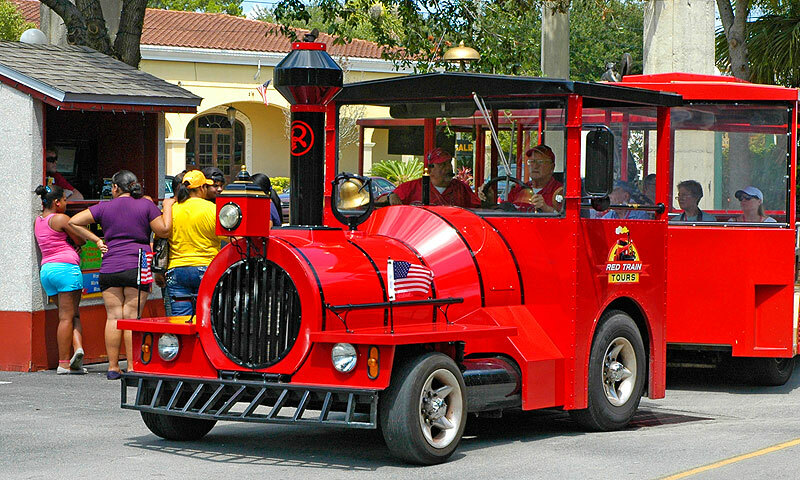 If and when you do visit St Augustine I would definitely recommend riding the red train. Please do a tour first before you do anything else. It explains the history of the town. You will find that St. Augustine is very much a pet friendly town and very protective of pets. You feel safe there and people are for the most part friendly. We bought a three day ticket on the 20th and with the senior discount it was a great value. Our sales agent Treva? i think her name, was VERY informative and gave great suggestions of things to do and places to eat. The second day we spoke with Bobbi, who also was very informative and friendly. She told us she was a maintenance worker, but her enthusiasm was terrific. Our favorite driver was a Wicked Awesome lady by the name of Cheryl. Now Cheryl pronounced Flagla without the R, and had us all laughing. She has a great sense of humor, but who from Boston doesn't! It was recommend that we take several different tours with different drivers as they all give the same basic info but with their own twist. That was certainly true and after taking several tours each driver has a unique spin on the loop. My wife and I appreciated the unique experiences and take each driver had. In three days we took 6 trips and learned something new on every single one. We will DEFINITELY recommend this tour company to all our friends. We will definitely be back The other trolley company ALWAYS looked so crowded. Smokey our tour guide was the best. He gave out a lot of information I would recommend doing this if your in St. Augustine. Thanks Smokey! Ripley's has many friendly, helpful tour drivers. Their low vehicles make entry and exit relatively easy. One small caveat: take the info presented with a grain of salt. While much of it is factual, some is editorialized and a bit is pretty far-fetched. I took this tour with my family and all of us loved it! We are familiar with St. Augustine but learned alot on this cruise and seen all if the landmarks. I highly recommend and would take the tour again! Paid over 60.00 for 3 adults and 1 child, and rode train. didn't realize until after tickets were purchased that train stopped at 5. We had seen the train come by our Hotel the night before around 10 pm. Now, we realize that must be the Ghost train costing more money. Big, Big rip off. Using the thought that they are promoting the history of old town St. Augustine, they are filling their pockets. Best attraction in St. Augustine is the Carousel (1.00 per long ride) and playgrounds.